Keeping a selection of children’s books (and perhaps some drawing paper) in the dining room can help antsy kids stick it out a little longer at the dinner table. Try a kid-height chalkboard wall. This half-height chalkboard wall makes a nice compromise when you don’t want to give over an entire wall of your home to kid-friendly scribble space. Little ones get to draw in the space they can reach, and you get to choose grown-up paint and artwork above the rail. Invest in adjustable stools. Kids can’t resist twirling these metal stools to adjust the height – but beyond the fun factor, they serve a practical purpose as well. Being able to twist to raise or lower the seat means everyone, big and little, gets to sit at the just-right height. Hang a big wall clock to keep the family running on time. Analog wall clocks can help kids get a sense of how much time they have left to play without as much parental nagging. And there’s a side benefit: if you usually use your phone to check the time, having a centrally located wall clock may help curb mindless media browsing (since checking the time on your phone can easily lead to checking social media or email). On rainy days, finding ways for kids to get their energy out can feel next to impossible. A cleared-out hall or side of a room where mini vehicles have (relatively) free rein. The same space can be used for racing Matchbox cars, laying out tumbling mats or unfurling a big roll of paper for a spontaneous art project. Designate a temporary art display space. Kids are proud of their work, so it’s natural that they feel reluctant to let you toss it right away, but that doesn’t mean you must keep every watercolour and crayon drawing forever. Designate a central place to display favourite incoming artwork for a limited time. When new work comes home, choose something from the board to and store only the most special pieces in an art portfolio. Self-serve art supplies empower kids to create – just be sure that the materials you put in the self-serve art area are ones that are always OK to use: in other words, not too messy and totally washable. 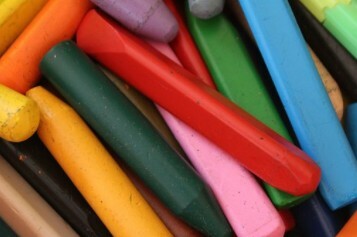 Think crayons, coloured pencils and washable markers. Stationing a play table in the living room (or whatever room your family tends to hang out in) gives little ones a designated space for putting together puzzles and Lego creations. Choose a table with built-in storage, and stash favourite toys inside for easy cleanup. Life with little ones is messy: there’s really no getting around it. But while we can’t prevent the messes from happening (try as we might), we can salvage our flooring from the chaos. What’s the secret? Carpet tiles. Perfect for high-traffic and mess-prone areas, carpet tiles attach to your floor (so they’re also nonslip), and when one gets stained or damaged beyond repair, you can simply replace a square rather than the entire rug.